A swearing-in ceremony for Sara Fowler as Clerk Magistrate of Hall County Court was held August 28, 2018, in the courthouse in Grand Island, Nebraska. Judge Arthur Wetzel opened the ceremony and welcomed guests. Judge Alfred Corey administered the Clerk Magistrate oath of office. Both judges presented Fowler with her signed certificate of appointment. Fowler had been serving as assistant clerk when she was selected to serve as clerk magistrate. County court clerk magistrates work under the general direction of the presiding county court judge supervising, assigning, and directing the work of all staff within the county court. The position carries a high level of responsibility for the people, paperwork, and records of the court. 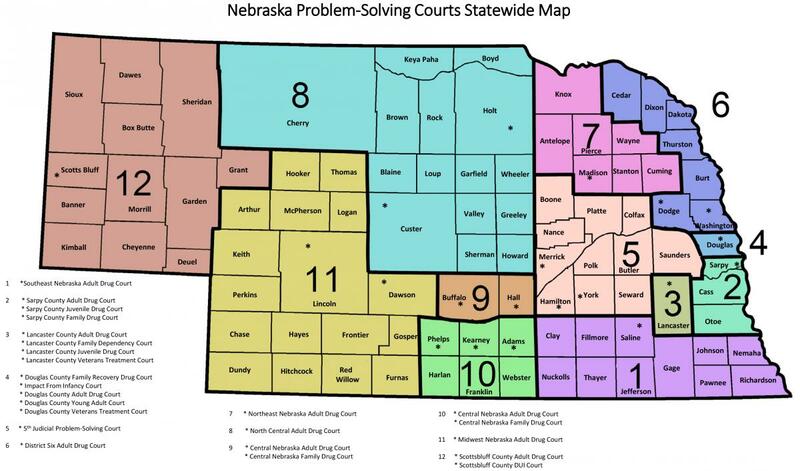 Fowler will be responsible to ensure the efficiency of the court’s administrative functions in one of Nebraska’s largest county courts. She will also serve as the county court Media Coordinator in Grand Island. As Media Coordinator, she will work with judges and news reporters to manage logistics for news coverage and news cameras inside the courtroom. She began her duties on August 1, 2018, replacing former Clerk Magistrate Jen Myers. Photos: Judge Arthur Wetzel, Sara Fowler and Judge Alfred Corey. Judge Corey administers the clerk magistrate’s oath of office with Judge Wetzel and State Court Administrator Corey Steel, Fowler’s children assist in the robing portion of the ceremony.